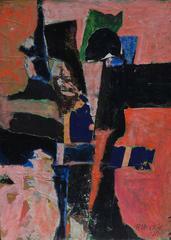 Presenting a just discovered mixed media painting by American artist Robert McIntosh, (1916-2010.) Ascension, is an original mixed media gouache on heavy artists paper, signed, c. 1958 with an image dimension of 30 x 22 inches, offered in excellent original condition. Please contact the gallery for additional information.